Matthew Weiner winks at his fans by opening and closing the mid-seventh season premiere of “Mad Men” with a song that could have been the theme for its iconic protagonist, the always-unsatisfied Don Draper (Jon Hamm). For seven seasons, Don has pondered the existential questions of life and pulled out the booze to keep on dancing. The end point for television’s most famous ad man will be television’s most discussed talking point for the next two months as the final seven episodes of AMC’s hit series unfold. Where do we leave Don Draper? It has to be a tough question for Weiner and crew as well in that there’s less of a defined end point than there has been for similarly popular shows. We may not have known exactly where Walter White and Tony Soprano would end up but the conversation was mostly about whether or not they would die or go to jail. And there were questions to be answered on a show like “LOST” that don’t exist in the world of “Mad Men,” a program that has played with complex queries like what it takes to be happy and the constant battle of image vs. reality. How does that kind of conversation end? Do we want a happy ending for Don Draper? Does he deserve one? Part of the joy of “Mad Men” is in watching how Weiner and his team pick up after months off the air—what year is it? What is the state of Don’s love life? How’s the business going? So I won’t spoil those elements of the premiere, walking more carefully with plot details than typical for a season premiere. I’ll say that the themes that have defined “Mad Men” are still very much at play in “Severance” as is Weiner’s willingness to spend time with characters outside of his core group of regulars. Ken Cosgrove (Aaron Staton) gets a major arc in the season premiere while Pete (Vincent Kartheiser) barely registers. I’ve always found Weiner’s ability to juggle the time that his characters spend center stage to be one of the most fascinating elements of “Mad Men”. We’re still in an era when most dramas feature the same characters week in and week out, giving each what sometimes feels like a contractually obligated number of lines. Much like David Chase did with Tony on “The Sopranos”, Weiner anchors every episode around Don but lets the planets that orbit him change from episode to episode. Don’t worry. The season premiere isn’t all Ken Cosgrove. Peggy (Elisabeth Moss) and Joan (Christina Hendricks) get an interesting subplot that proves that “Mad Men” is not done discussing the changing role of women in the business world and the way they’re treated differently than their male peers. When a man makes a joke to Joan that she should be selling bras, the frustration that these characters still have to deal with such nonsense is palpable. And these scenes come not long after we’ve witnessed Don at his most free-wheeling. Remember, Don, Roger, and the gang are filthy rich now after the buyout at the end of last season. And there may be nothing sadder than a lonely man with a lot of money. “Severance” opens with images of success: high fashion, beautiful women, parties. And yet there’s still a vein of sadness even in the early scenes that becomes more pronounced as this episode progresses. 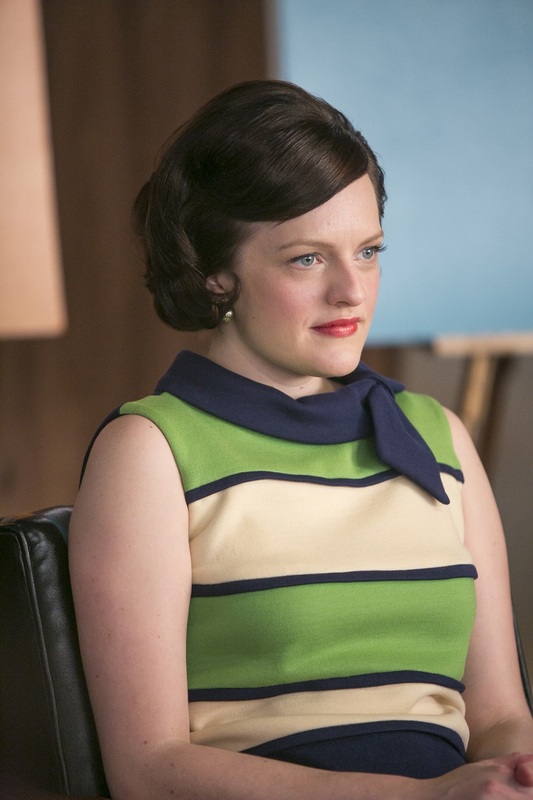 The final arc of “Mad Men” feels to me like it’s going to be one of regret. Memories of love lost and failures, both business and personal. And the theme that the image and perception that these people sell is often a lie could be the overriding one of “Mad Men” from first episode to last. Peggy is arguably the smartest person in every room she’s in but she has to deal with the image associated with her gender. On the other hand, Don commands respect with his quick wit and suave style, but he could be the most melancholy protagonist in TV history. Pete’s desperate grabs at images of success; Roger’s cynical understanding that none of it means much. What will these characters learn by the end of “Mad Men”? Will they learn anything? It’s no coincidence that Don is looking in the rearview mirror in that image at the top of this review. He’s looking back on his life while moving forward. And you can almost hear “Is That All There Is?” playing on the car radio.